We were delighted to recently welcome 100 year old local Mary Roberts, known as ‘Aunty Mary’ to everyone in Rhosneigr, to open the doors to the newly renovated Sandy Mount House. 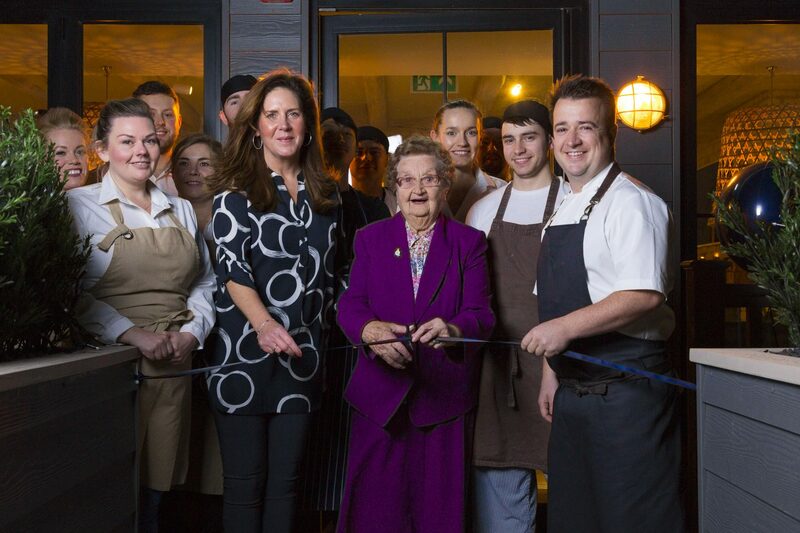 Locals and guests were invited for a sneak preview evening of the stunning new restaurant and bar, which is now open to the public. Guests were treated to prosecco and canapes, giving them a taster of the Sandy Mount House menu created by chef Hefin Roberts, which includes an array of fresh local Welsh produce. There are Menai mussels, Halen Mon and Mon las blue cheese, locally cured bacon and handmade sausages from E.T.Jones and even Anglesey lamb from Dolmeinir farm features on one of the restaurant’s unique pizzas. The drinks menu features a special take on a Bloody Mary – it’s been christened Aunty Mary in honour of the village’s much loved Aunty. As well as a stunning restaurant and bar, Sandy Mount House has seven luxury boutique hotel rooms, which are now available to book. Sandy Mount House is open seven days a week from 9am – 11pm, serving breakfast, coffees, drinks, lunch, dinner and bar snacks. Last orders for evening meals is 9pm.